About a week ago, I take the hot seat in a Tribe meeting. I have a long-standing Tribe relationship with the other members and we decide to try meeting my Skype. The Remote Tribe seems to work well and the meeting lasts about three hours. I bring a long-standing issue to Tribe about people who treat me poorly and my associating attempts to try to get them to treat me better. The other Tribe members assist me in localizing the issue to a lump in my throat - a feeling that associates with pressure, sadness, anger and nausea. The Tribe quickly gets me deep into my forms - and more issues emerge, like people running away and abandoning me. I wonder what I do to get this result so consistently. Then, something strange happens, although I kind of expect strange things to happen in Tribe meetings. My process manager goes into process himself, and commences talking about his own issues. At first, I find this annoying, like an intrusion into my hot seat process. The feeling in my throat flares up. I also notice how this all fits with my abandonment issue. I trust the Tribe process and decide to go with it and shift into the role of process manager for my former process manager. I don't exactly remember the details of his process. I do remember that as he moves through his issues, the feeling in my throat loosens up - and even starts to feel good. After we complete his check out, we return to my process. Then, suddenly I see something obvious that I could not see before. My old Rock links the feeling in my throat to trying to get the person who abandons me to come back to me. I release this Rock and replace it with a Rock that links my throat feeling to letting people go when they abandon me - and to make room for a better match. My throat feeling and former nemesis becomes my valuable ally. Since making this discovery and implementing my new Rocks, I notice the world looks very different. I have very little interest in chasing after people or situations that do not seem to work in my interest. I also notice myself bringing allies closer and not pushing them away in a self-fulfilling abandonment loop. I find that I get things done much more easily since I do not worry so much about people letting me down half-way through a project. I deeply appreciate the gift I receive from my Tribe members during this process. Thank you for sharing your process and for documenting the Tribe meeting. Yes, you may share the link. The City of London Tribe is still going strong. Recently, someone with previous experience from your Tribe meetings joins our tribe. He returns to TTP after several years off with some new k-nots. His experience benefits the tribe. I have found more recently that I work on feelings related to trading. Specifically the feeling of complacency and the feeling I do not like getting when my complacency leads to losses or missed opportunities. I also work on the feeling of wanting to make money and the feeling I do not like when I force trades in order to try and get money from the markets. Work on these feelings have resulted in forms that I enjoy. I am curious to find out how frequently dramas related to 'wanting to make money' and 'complacency' play out from now on. I keep a daily journal of my thoughts and feelings in order to help monitor this. I wonder if you have ever worked with people that are depressed or have autism and what impact TTP had on their lives? Depression and Autism generally refer to deep behavior patterns. TT Rocks process may have some value in rewiring feelings-to-behavior response functions (Rocks), particularly in cases involving early psychological trauma. In cases involving physiological trauma, the TTP Rocks process might not afford much traction. You might consider consulting with a professional psychologist to get a handle on the underlying issues before proceeding. Ed, is that moron in chief your idea of what should be inhabiting the White House? Read his quotes from the NY Times and defend the hypothesis that he had a real brain. Thank you for reaching out to me for information about the President and for sharing your anger and frustration about the political situation. To reiterate my position, I see the US and other Western economies going through a phase I call the 39th day, in which the Govopoly System (monopoly by government sanction) assimilates the Free Competition Sector. For more on this, see the free preview of my book, Govopoly in the 39th day, on this site. I see this process accelerating, and as part of an inexorable multi-century cycle in which we get more inflation, debt, regulations, dependency on government and class alienation. Eventually we get an outcome similar to what you can currently see in Venezuela, even Puerto Rico. The assimilation cycle also includes a re-framing of the election cycle - away from national policy discussion and toward distracting and divisive theater for the masses. Citizens come to vent their anger and frustrations upon gladiators running for office – rather than dealing with basic issues such as the degree of regulation and taxation, the standard of living, the safety of savings, the sanctity of contract and the buying power of the dollar. Rather than contemplate the evolution of culture, they position themselves to hurl invective at the gladiator of their choice. I do not have any desire to defend or attack any particular politicians or comment on their mental conditions. I notice that, post election, the President's attempts to “drain the swamp” also serve to reveal the depth and power of the swamp, or as I call it, the Govopoly System. You might consider taking your feelings about <political figures as personal enemies> to Tribe as an entry point. Look at the stock long term price charts of FB and AAOI. Makes you wonder why anyone would monitor stocks daily. Some people seem to prefer running drama to achieving success. Hi - While researching Vincent van Gogh, I found your page: from 2003, April 13-19. Our Vincent van Gogh page provides visitors with van Gogh's bio, over 90 of his works, exclusive articles, and up-to-date van Gogh exhibition listings. The page also includes related artists and categories, allowing viewers to discover art beyond our van Gogh page. We would love to be included as an additional resource for your visitors via a link on your page. If you are able to add a link to our van Gogh page, please let me know, and thanks in advance for your consideration. Bedankt voor het verstrekken van de link. Ik herinner me het bekijken van een aantal van Van Gogh's werken in het gemeentelijk museum in Holland. I notice TT Chartbook not updating last night. I primarily use the TT_Chartbook. Like you, I am an Electrical Engineer & even though we've never met I feel a connection with you. While I love engineering, I have so many other interests, I have difficulty sticking to one thing all of the time. I've read about every investing book that makes sense to me and many that don't. I found myself gravitating toward trend trading. I found you in the Shwager book about a year ago. I've had some fair success at trading on my own, but when I stumbled on your site I became very intrigued with the concept of modeling the various theories I've thought up over the years. I set up a Linux server, and I'm working with a partner to create a database right now to try this out. Long story short, my concept was to save all of your chart books for at least one year, I started at the end of August 2016, and to analyze what stocks you are picking to see if we can determine what you are doing. We've have made some headway at developing "strategies," Think or Swim term, to identify many of the stocks you're picking thus far. We definitely see the momentum aspect, & we've been playing a lot with the EMA lines and volume. We like the Fibonacci sequence so we tend to use those price EMAs though we're not sure if that matters to you. Visually, they are appealing & they seem to possibly correspond with other ideas on your website. Hope this doesn't sound odd, but I had a dream on Wednesday and you and I were shooting pool together. Thank you for sharing your process and for reporting the operations glitch. Operationally, the system downloads data, performs analytics and posts results and charts to TT_Chartbook daily and completely automatically, at least in theory. So far, the system does not know how to cope with power outages, Internet interruptions, and hardware failures. The system generates a "success report" after it runs. I get this report by email the next morning. I case of system failure, I also receive various other email, such as from you,. If you ever get to Austin, perhaps we can meet at "Clicks" for a few racks of eight ball. I'd like to participate in a Workshop in Europe. I realize I have a k-not about fear that is stopping me to develop both professionally and in private life. I think about the issues I'd like to bring to such Workshop and the conscious mind keeps bringing rational issues until this morning when I wake up after dreaming of wasps and a hornet which make me realize fear is behind all of those rational issues. I fear you may pass away before I can experience TTP with you. I fear as English isn't my native language I may find it difficult to fully participate in the workshop, but then somehow realize TTP is more about forms than words. I feel like I self-sabotage, whenever I reach some success I need to find a way to destroy it. The fear rock passes among males in my family and I fear I pass it to my son too. I buy your book back in 2008 and jump straight to trading section only to realize it's so thin and doesn't contain any extraordinary advice. I completely miss the rest until now, some 9 years later. I read it again just to see it contains hints on many issues that I needed to find myself during those 9 years. I may not be ready for TTP back then. Thank you for sharing your process and for raising the Workshop issue. I can post invitations on this site to measure interest in Workshops in the US and in Europe. I am over here in [Country]. I recently heard Ed on the Mike Covel podcast. Very impressed. I don't play the Banjo. I am new to trading and am committing to trend following style of trading. I like to learn more about your system and rather than go in an root around I's like to be on the front foot. I have worked all my life for factories and at 60 years old and scraping to make a living I am heading on a new journey trend following on the stock market. They tools I use are INTERACTIVE BROKERS and Finviz for analysis. My model thus far is to stick with stocks less than 30 USD with a volume > 150k and with performance up the last today and the last 20 days. I am operating to a loss at the moment and need to turn this around. - fix a process to enter a stock and exit a stock. What can I get from the Trading Tribe by way of quick education and connect to the culture as well? Are you in a position to provide guidance on this please? I see you'd like a quick education. You also seem to like quick trading and quick profits. You might consider running some back tests on systems that use quick trends and on others that use slower trends. In this manner you might come to find a system that suits you. This current year (2017) we have seen amazing returns from the market. However, P/E ratios are extremely high and the entire US market seems to be widely overpriced. Do you have a collection of specific indicators that help you to know if the market has "topped" or "bottomed" out? Timing is one of the biggest factors when investing in the market and I take this concept very seriously. I have difficulty knowing "when" to enter a market, and "when" to stay on the sideline. Please let me know if you can shed some light on this question. Trends, and other rates, have no instantaneous values. To compute a trend, you have to compare averages prices now with average prices then. Trend measurement requires averaging so you cannot define a trend until after the fact. Trend traders get in and out of markets after the trend changes. They do not and can not pick tops and bottoms. If you like looking at tops and bottoms, go to a swimsuit-optional beach. If you want to trade trends, look for sides. You might consider taking your feelings about <perfection> and <getting 100% on tests> to Tribe as an entry points. Well am very interested in learning your trading methods. I am mailing from Ghana in Africa. How can I be admitted? You can admit yourself by reading and contributing to this blog. Last Tuesday I attend another Tribe meeting. I go feeling distracted by life events. The meeting is not where I want to be, I feel I have more pressing issues to address. The check in follows the same process. I enjoy the drumming and the focus on the moment of drumming. The life events take a back seat. Each member take the hot seat. I enjoy the support I provide to each. All the members give encouragement to the person in the hot seat. Our Tribe also drums at same the time. The drumming while receiving helps the person in the hot seat shout as much as they need to. By the end, there is no time for me to take the hot seat. I feel happy with that, I am very tired by this stage and find it hard to keep my eyes open. The meeting reminds me of the moment of now. The whole process puts me back into now. The drumming, the receiving, we only have now. Everything else is either memory or imagination or a combination of both - I am open to being corrected on this. The following days after each meeting gives a strong feeling of present consciousness. I continue my meditation and yoga to support this. Each tribe meeting has ‘topped up’ that feeling. It feels good. I like to hear your thoughts on this [article], and how does this relate to the Govopoly system? Also, what trading opportunities might arise from this kind of mass behavior/mentality? Forget lazy, self-centered or cocky — the truth about most millennials is they’re absolutely hopeless when it comes to basic life and workplace skills, experts say. As the Govopoly System assimilates the Free-Competition Sector we see a reduction in the overall competitive spirit and a reduction in the work ethic. You might expect, in the long run, to see a relative reduction in the US standard of living, as the reward/work ratio seeks equilibrium with that of other countries. This reduction in standard of living may imply higher prices relative to wages. 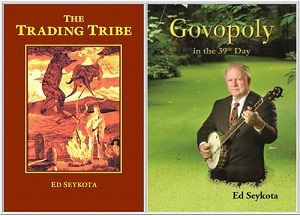 Ed replies, " I wonder where you look and how you find my books for sale for $350. I sell them from my site for $125." Thank you for answering my email Ed. Your book is on Amazon for 350. I was shopping for my husband who holds you in the highest regard. Our entire family does. Your work gave my husband and son the inspiration to build their own mechanical models. By applying Bill O'Neils philosophy of price / volume on the NASDAQ index, along with your systematic trend following and money management they built a system they are excited about. Now that our children have left the nest I am trying to get [my husband] to teach your system to me. I just finished a 30 year project raising our two children and volunteering with my therapy dogs in nursing homes, hospitals and hospice. Thank you for bringing me up to date on the price on Amazon. I notice it fluctuating between $250 and $1,000. I have a couple customers who buy many books from me for $125, apparently to resell them at a profit.